If you have an extensive collection of Blu-ray’s lying around, you might be wondering how you can watch them all on your Android tablet, such as Galaxy Tab S4 and Google Pixel C. There’s nothing quite like watching a movie whilst travelling or when away from home, and the experience can be even better than playing a physical Blu-ray because movies start instantly on Android OS. The Android tablet is an especially good video playback device due to the large screen size and hi-resolution display. HD (1080p or 720p) movies play brilliantly, and it’s possible to transfer quite a number of films to the Android tablet – depending upon the storage capacity you have available. This article describes the basics of how to watch Blu-ray movies on your Android tablet. 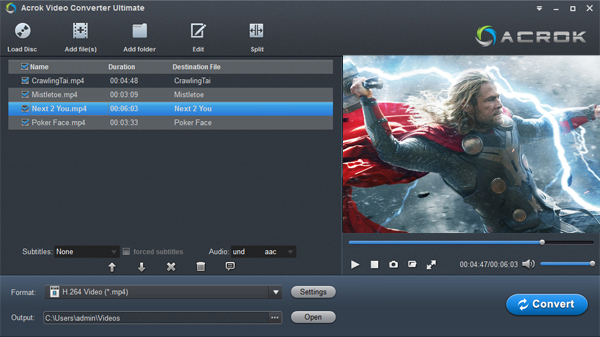 Acrok Blu-ray Ripper (Video Converter Ultimate) has a simple interface which makes it a doddle to convert a Blu-ray (Blu-ray disc, Blu-ray ISO, Blu-ray folder). There are lots of built-in presets which are already setup for the target device you want to play on (for example, the iPad Pro, iPad Air, iPad Mini, Galaxy Tab S4, Microsoft Surface Pro, Asus ZenPad 3S 10, Galaxy S10, LG V50 ThinQ, Nokia PureView and all manner of other multimedia devices). There are also options to manually tweak the output formats and bit-rates (i.e. the quality of the video) and a choice of multimedia formats (such as H.264 and MPEG-4 video, AAC and MP3 audio) to get the optimal settings. For example, you might want to use a higher quality setting if you feel that the presets aren’t good enough. 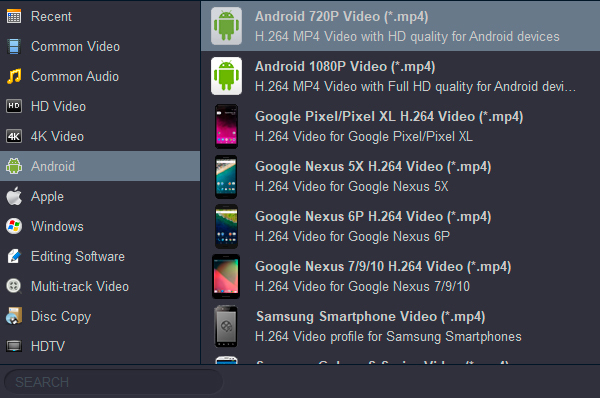 Acrok program is also one of the cheaper Blu-ray ripping apps. Once you’ve copied and converted a Blu-ray, you’ll transfer it into your tablet. 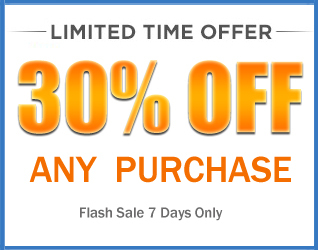 You can get Acrok Blu-ray Ripper via 30% Off Coupon Code now. How to rip and convert Blu-ray to Android tablet supported formats? Insert the Blu-ray disc into an external Blu-ray drive, start the top Blu-ray Ripper on your computer, click “Load disc” icon to load Blu-ray files into the program, apart from Blu-ray disc, you can also use the program to load Blu-ray BDMV folder or ISO image file. Click “Format”, from its drop-down option, select the output MP4 file types according to your own needs. For high quality, it would be idea for you to choose “H.264 Vided(*.mp4)” under “Common Video” main category. For fast conversion speed, “Android 720P Video(*.mp4)” would be the best output options. For playing 1080P movies on Android tablet, you can get this output option under “Android” category. Tip: Now that you’ve settled the Android preset, you may also need to choose your encoding settings based on the device(s) on which you plan to view the content. You can tweak every aspect of encoding, change format, bit rate, frames per second etc. You can experiment with these settings in time to see what works best with your media. Note: If you don’t have enough confidence to set parameters, please choose the solution we provide directly. Start to convert Blu-ray to Android 1080P or 720P video by simply clicking the “Convert” image button. You can sit back and wait for the program to do the conversion work for you. When it’s finished, you will be notified with a successfully message. You can tranfsfer the ripped movies to your Android tablet for playing freely. 1. Connect the Android tablet to the computer by using the USB cable. 2. On a PC, if the AutoPlay dialog box appears, choose the option Open Folder/Device to View Files. 3. Open the source and destination folder windows. 4. Drag the file icon(s) from one folder to another to copy. 5. Close the folder windows and disconnect the USB cable when you’re done.